It is now just two weeks after the Closing of our Time Travel Symposium and the Next Dimension Workshop, in Kona, Hawaii. These 2 events were so powerful for the Speakers and guests who attended, that all participants agreed with Alfred Lambremont Webre and Andy Basiago when they announced that we had absolutely jumped into a new and positive timeline during the week of June 24th. We had created a new Template. Alfred was especially moved by the dolphin interactions and by the program and people of the Symposium, by Jean-Luc’s artwork, and the further evolution that occurred due to the additional swims and his participation in the jump room processes of the Next Dimension Seminar at Sky Island Ranch. I wasn’t sure what it was that touched Andy so deeply. 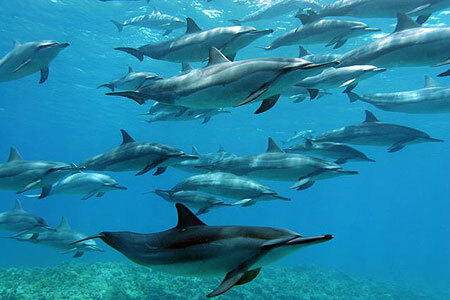 I think the supportive and loving response of the invited guests – all from the Dolphin Connection mailing list (a very aware, loving group.) It was very healing for Andy who previously had an unfair share of negative feedback from the skeptics that he so patiently educates on his Facebook pages and at conferences he attends that focus on Conspiracy Theory, rather than the Truth Campaign. Andy takes a more positive and practical stance regarding Teleportation. He would like these Time Travel projects to be de-classified, making the technology available to everyone for the good of humanity and the Earth. Andy did not go on the boat trips, so he did not have the dolphin boost (except for the after-glow from the people.) He also could not stay for the 2nd week of the Next Dimension Seminar. And yet during the three extra days after the Symposium when he stayed at the Ranch with the rest of us, he was on fire with ideas, requesting that I do more of this same kind of Symposium. Even Jean-Luc suggested I organize another one in 2-3 months. Our friend and keynote speaker, Laura Magdalene Eisenhower fell in love with the Spinner dolphins, the gentle energy here and the people of Hawaii, and looks forward to returning to the Big Island. It was a rewarding experience for everyone. Then along came Jean Houston to visit and was caught up in the energy at the Ranch and on the boat with the dolphins and she felt a new Template was forming as well. We hardily agreed with her. For myself, I see it approaching clearly and perfectly. Being more of a feeling and experiencing person, I don’t often put it into words. It is definitely unfolding, right before our eyes and it is good and exciting and healing and transformative. On the final day of our Next Dimension Workshop, I met with Ron of California. He was here attending the seminar at Sky Island Ranch. A month ago he had shipped to us a 100 pound sacred Crystal Wheel that related to my birth date and was a Portal for me when I was ready to experience it. It was a Doorway to the Inner Earth, highly evolved civilizations. 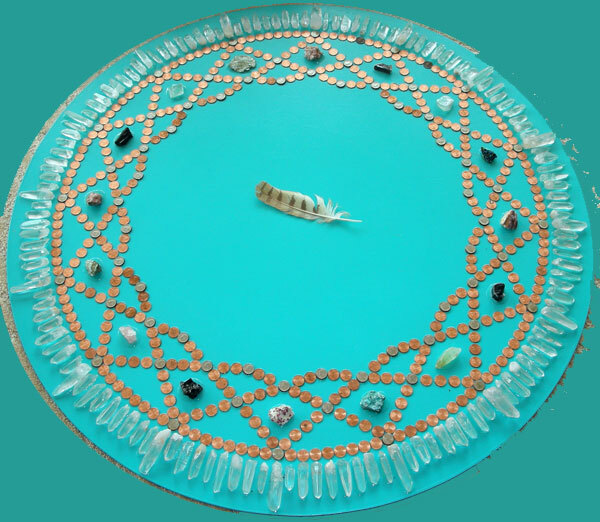 The portal that he sent to me has 144 singing crystals attached to it, pointing outward around the periphery of the circular platform. The copper pennies used to interact with the crystals and adorn the wheel as holographic pyramids are ones that were cast with the year of my birth. He collects coins from round the world to find the ones he needs to use. The base is painted a beautiful turquoise blue. As the workshop ended and people were beginning to leave, I did not want to miss the opportunity to have Ron work with me and guide me thru his Stargate, now resting in my home. With people walking by, talking and laughing and having lunch, we went into a deep trance state. In 5-10 minutes I was propelled into another world where I met very tall Luminous Beings of light who told me they were 5th dimensional beings who live within the earth. They explained they would make themselves known to some of Earth’s population so that we could experience their 5th Dimension reality together. I was immersed in a sphere of ultradimensional Love, knowing that I would return regularly to enter their world. Later Ron told me about his work of putting loving fields of energy into sound systems in the Hollywood film industry and other locations. Giant generators that he invented and operates are two times the size of the Ranch house. They generate light and sound for major motion pictures, while his spiritual contribution is to add the frequencies of Love and Harmony into the soundtrack. His work with Warner Brothers’ Studios includes the Walt Disney films. That is why people come away feeling good after seeing the movies and want to see more. Ron was guided to astrally enter the inside, the center of the giant generators, and feel their power and emanate Love. He described what that felt like, as he spun round and round inside, ad nauseam, until he finally adjusted to the powerful rotations and was able to be spinning inside without disequilibrium, charging the generator light and sound with pure Universal Love. Ron also has been age-regressed by 20 years at least once, maybe more. (It was interesting that Gregg (in the Seminar) insisted that Ron looked exactly like his father.)…. Maybe he is, we never asked! Having some quiet time a week later, I realized that everything in my life had changed. This had actually begun in 2010 as I prepared to convene the Symposium and also in January, 2011 when I began to enter a Jump Room to bring major changes into my current spiritual, intellectual and emotional life experiences, based on meeting my twin selves in other dimensions. This is a very powerful and effective means of transportation for me. I am learning all kinds of new things and new abilities I had never had before. Listening to the wisdom of Andy Basiago and Laura Magdalene Eisenhower and Alfred Lambremont Webre was instrumental in my changes along with my ongoing contacts in parallel realities with the dolphins and with my twin selves. My friends, the Arcturians confirmed my decision to share my Inner Earth contacts with people in my Seminars.  I sat down to write about it, preparing what to share and how to introduce the groups to these 5th dimensional people to the extent the group members were ready to perceive them and communicate telepathically. As I sat and planned, I realized I was not alone. The Inner Earth people were contributing their ideas and adding more interesting information about the environment, the life style, the physics, and more of the hollow earth world. I can spend long hours in contact with them. On July 16th, having been off island for a week, I was longing to see the dolphins and be in the ocean. The captain had a space on the boat for me. I arrived at the Harbor at 6:15 A.M.
My friend Nikki was coming too. We saw no dolphins as we left the harbor and headed north. Then while we were all talking, a pod of Spinner dolphins was sighted close to shore milling around just south of the Energy Labs. This was an unusual place for them to be, so we observed them for a while and then the captain put some people in the water to see if the dolphins wanted to include us in their pod. They did not. They kept moving. People went into the water a couple of times and still the dolphins did not interact. Meanwhile I remained on the boat. I could see that the dolphins were pre-occupied and were not going to be with us and so I waited, silently communicating with them. Leaving the Spinners to their quiet deep water activities, we saw a few dorsal fins of Bottlenose dolphins. We came close to them but they did not ride the bow wave as the Spinners had. These Bottlenose dolphins also seemed to have other things on their mind besides us. Again I waited to see how they would or would not react to swimmers. The dolphins swam away initially, but then I saw them coming back. There were only 3 of them. When I saw they intended to stay I slipped into the water with them. For the first half hour, they stayed mostly deep coming up alongside us only to breathe. They were not avoiding us and they were not leaving the general area. So I knew we were meant to stay there in the water with them and be with them while they chose to remain close to us. That seemed to be fine with the group of 9 of us on the boat. Only Dana who is a photographer, myself and one male passenger were diving down with the dolphins, accompanying them as long as possible and surfacing with them for air. Again I noticed the dolphins did not mind our presence, but they were not being overtly interactive. Getting in stride with them, I was having many close swim-alongs whenever they surfaced. I noticed they were always circling back to where I was in the water and so I was having a wonderful time. There was one very large Bottlenose and one smaller sized female with a three month old baby dolphin who was nursing occasionally. Swimming alongside all three of them, they moved ahead of me by about 8 feet. Watching them intently and swimming fast now to come alongside them again, I noticed a phenomenon I have never seen before in all my 30 years of swimming with dolphins. As I watched and swam alongside them on the surface, the largest Bottlenose was on the left with the mom and baby on his/her right side and trailing behind him a little. Unbelievably as I watched, the small mother dolphin, moved up alongside the big one, turned toward him and put her rostrum into the right side of his very rotund belly. Suddenly I noticed she was disappearing. I ducked my head down beneath the surface of the water looking at his underside to try and understand what I was seeing. Was she slithering under the belly of the big dolphin? No she was not. As I watched, she literally swam INTO the belly of the big dolphin, moving through the dolphin’s body very slowly and out the other side of him. I could see her rostrum and head going through the center of his stomach and coming out on his left side. I could see his body above and underneath her tail, as the tail slowly disappeared into him. She was totally inside him, moving through him, and coming out on his left side. This was done very slowly so that I could see I was not imagining this, the entire body of the young mother dolphin went into one side of the dolphin and came out the other, looking at me as if it was the most natural thing to do in the entire world. The baby then swam around the back of the big dolphins’ tail and joined the mother, now on the left of the big dolphin, to swim next to her again. What had happened? I could not deny what I had plainly seen. It appears that a species as advanced as the dolphins are, can interact with the molecular structure of physical form, merging with it and then returning to their individuated form once again. As the Bottlenose group picked up speed, I remained where I was, floating in the ocean, integrating the experience with all that I know about them. Dana swam over and was expressing her joy that we could be with the Bottlenose for such a long period of time. Agreeing with her, I heard myself telling her what I had just experienced. She knows I am rational, logical and experienced in the field and that I don’t lie. So she was also amazed. Later she sent me some of the photos she had taken that morning. I felt this demonstration was directly related to my new frequency-level due to all the things I have experienced lately as mentioned above. 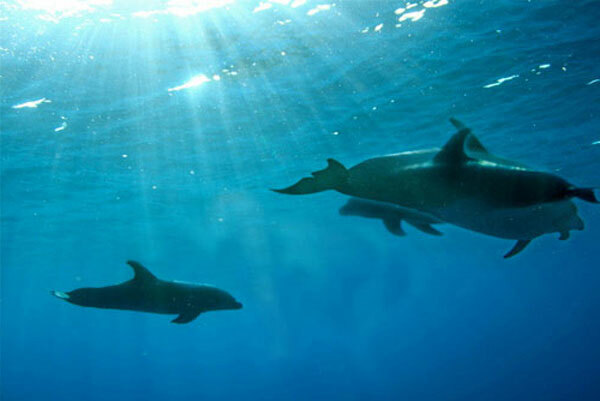 To myself I wondered if this was a new behavior the dolphins could now show me OR if in my new and heightened state of awareness, I am now able to see and acknowledge these things the dolphins have been doing all along. 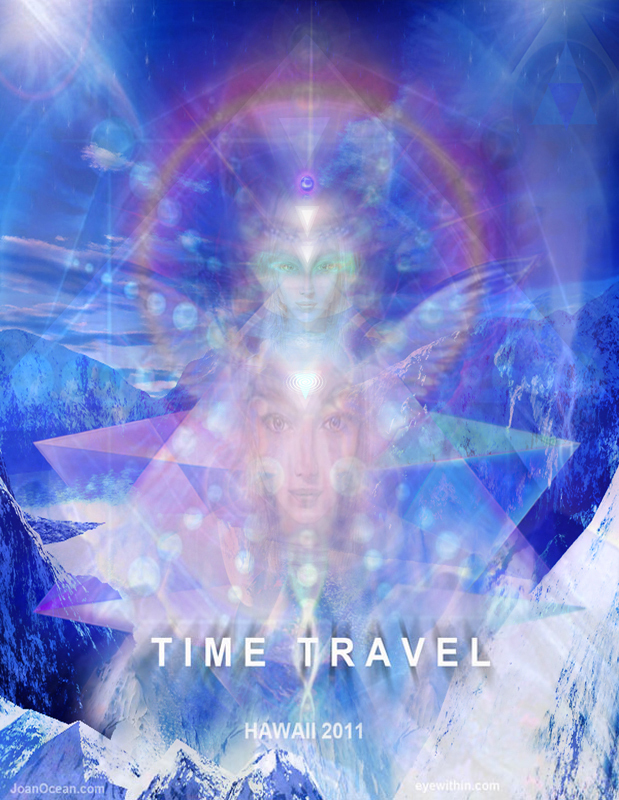 As evolving participants in Gaia’s transformation, we are all moving into the 5th dimension in readiness for physically meeting the Inner Earth people who reside in higher consciousness, the Star Nations who also reside there and the dolphins who are preparing us as always for the next level of 5th dimensional living.